Just want to share few blueprints with you. This project uses Hierarchical Instanced Static Meshes with various math algorithms, to make "procedurally generated environment". You already saw few of this things in ContentExamples and Blueprints projects. 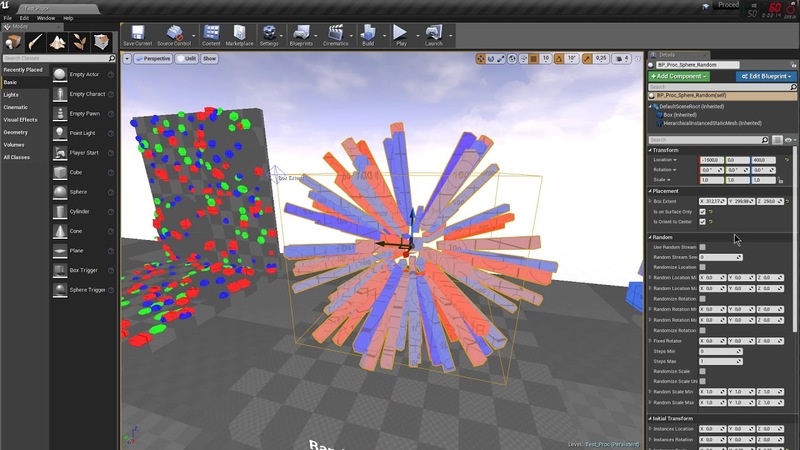 If you heard something about instancing, you know it allows you to create a lot of copies of static mesh with the same properties - material, lightning, collision, etc. The only thing you can change is mesh transform. First of all - provided examples uses static mobility of HierarchicalInstancedStaticMeshComponent. Be very careful with changing it's mobility, because it may switch relative/absolute instances transform. It contains only one blueprint - BP_Proc_TransformsArray, which uses simple editable array of Transforms, and process it to place instances. Use it to instance meshes when you need to place them manually. This is various circles and grids + some randomization. Also, here you can find one example of how to transform instances during runtime. 3. Instances transformed by shape. This means bunch of instanced randomly placed in sphere or box shape, or on their surface. Instances that placed using ray tracing results. Instanced placed along spline with some additional manipulations. Last edited by redbox; 07-20-2018, 11:04 AM. - Added Spiral actor, which can generate simple helix, or archimedes spiral shape. - Added example of using random seed (RandomStream) in randomizations, to make it more static by seed value. So, randomization remains the same for specific seed value, and not breaks static lightning results. This setup is a little bit complex, and maybe not really accurate, but I hope someone will find it usefull. Last edited by redbox; 07-07-2018, 03:29 PM. Few fixes and improvements for RandomStream usage. For now, all randomization features included in BaseRandomActor, so it's child actors can use RandomStream feature. No, this project is not uploaded to GitHub. For now only on GoogleDrive.